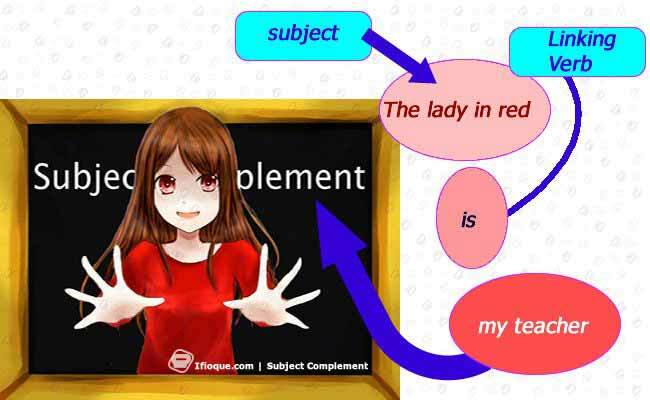 A Subject complement is the grammatical element which follows a linking verb (copular verb)Opens in new window and complements the subject of the sentence either by specifying an attribute of the subject or its identity. A subject complement can be either a nounOpens in new window or pronounOpens in new window, or an adjectiveOpens in new window. It was he who caught the audiences’ attention. It = subject; was = linking verb; he = pronoun acting as subject complement. The Egyptian suddenly becomes benevolent with his wealth. The Egyptian = subject; becomes = linking verb; benevolent = adjective acting as subject complement. An important point is that subject complements do occur in two forms, namely: predicate nominative and predicate adjective. The subject of the sentence which is renamed by a renaming noun phrase, which may be in form of a noun or a pronoun is known as a predicate nominativeOpens in new window; in the case where the subject is described by an adjective, it is known as the predicate adjectiveOpens in new window. In the following examples, the first underlined words are subjects of the sentence, the linking verb are in bold, and the words following the linking verbs (also underlined) are the subject complements. A Brief Insight on Copular Verbs. A Copular verb (also known as Linking verb), is a sort of verb which connects a subject and its complement. The Linking verbs are often forms of the verb to be, but are sometimes verbsOpens in new window related to the five senses (look, sound, smell, feel, taste) and sometimes verbs that somehow reflect a state of being (appear, seem, become, grow, turn, prove, remain). A victory would seem unlikely given the circumstances. The Grammatical Forms that can Function as Subject Complement. 1. Noun Phrase — A Noun phraseOpens in new window can be formed by a noun or pronoun, and modifiers, complements, or determiners such as; adjectives, prepositional phrases, noun clauses, and verb phrases. I will become a football coach. 2. Adjectival Phrase — Adjective phrase (or adjectival phrase) is a group of words that describe a noun or pronoun in a sentence, they are usually placed before, or after the noun or pronoun in a sentence. Andy is a talented footballer. 3. Prepositional Phrase — A Prepositional phraseOpens in new window is a group of words containing a preposition, with a noun or pronoun as object of the preposition, and any modifiers of the object. A preposition is usually positioned before its object. The most cultural region is in the north. 4. Verb Phrase — A Verb phraseOpens in new window is a group of words containing an head verb plus complements and adjuncts as modification for the head verb. Her favorite hobby is seeing movies. 5. Noun Clause — Noun clauses are dependent clause that acts as a noun. Noun clauses are used as the subject or subject complement, direct or indirect object, as well as object of a preposition. The venue of the event would be wherever you want. NounsOpens in new window and adjectivesOpens in new window most frequently function as subject complements. Grammarians (as mentioned in the beginning) specifically name nouns functioning as subject complements: predicate nominativesOpens in new window; and adjectives functioning as subject complements, they name predicate adjectivesOpens in new window. These two terms are quite important to familiarize in your repertoire of grammatical knowledge.